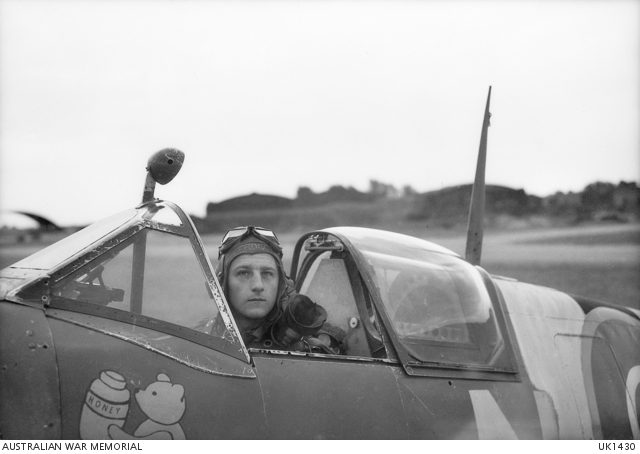 This excerpt on Australian Spitfire pilot training is taken from Australian War Memorial Records AWM173 7/4 Part 2 ‘Narrative of RAAF in Single Engined Squadrons of Fighter Command. “In single engine fighter squadrons (Spitfire and Hurricane) the normal compliment of operational aircraft is sixteen held on initial issue and at least two or three aircraft held on immediate reserve. These aircraft are manned by about 25 pilots who are divided into two flights, A and B of approximately equal strength. The ground crew are similarly divided and service the aircraft allotted to their particular flight. In actual practice it is usual for each ground crew to have one particular aircraft as their charge. 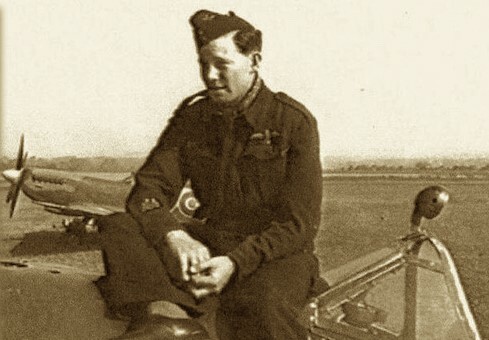 Each of the flights is commanded by a pilot of the rank of Flight Lieutenant and the Squadron is commanded by a pilot of the rank Squadron Leader. 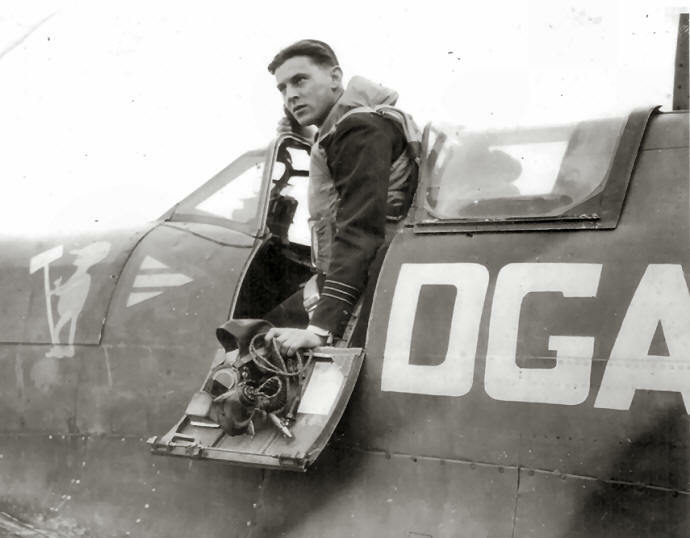 When William Brambleberry met and joined 453 SQN, the Intelligence Officer at the time was Flight Sergeant Gordon Henry “Catch” Catchpole of Guildford, Western Australia. Stay tuned for a post about “Catch” and his work with 543 SQN in a few weeks. CORNWALL, ENGLAND. C. 1943-08. FITTERS OF NO. 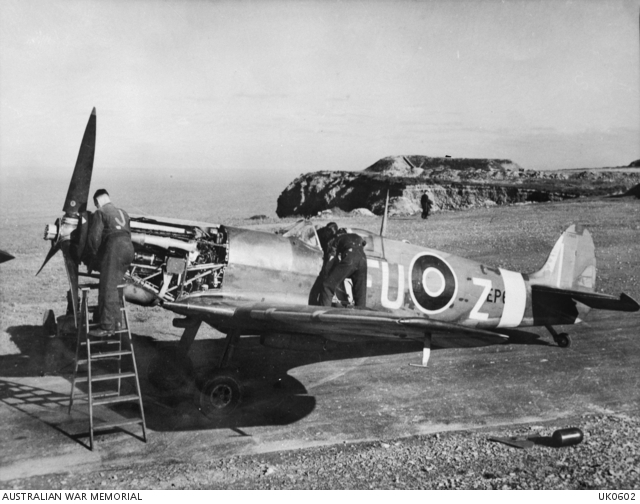 453 SQUADRON RAAF, WORK ON A SPITFIRE AIRCRAFT AT PERRANPORTH AIRFIELD. SUSSEX, ENGLAND. 1944-05-25. THE INTELLIGENCE OFFICER INTERROGATES PILOTS OF SPITFIRE NO. 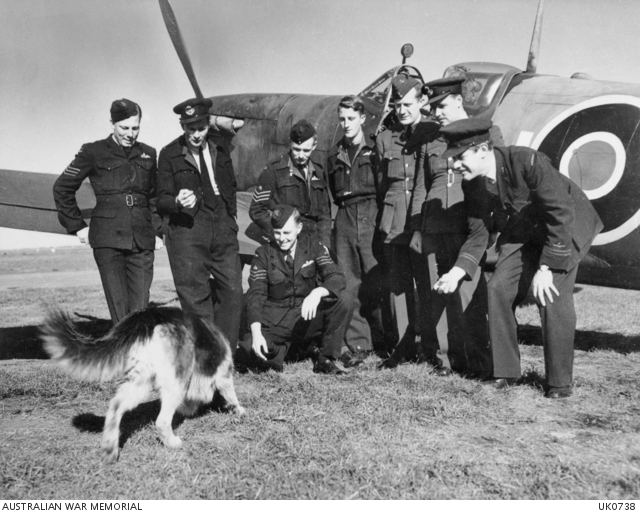 453 SQUADRON RAAF OF THE 2ND TACTICAL AIR FORCE, BASED AT RAF STATION FORD, ON THEIR RETURN FROM AN OPERATIONAL SORTIE. SUSSEX, ENGLAND. 1944-05-25. SPITFIRE AIRCRAFT OF NO. 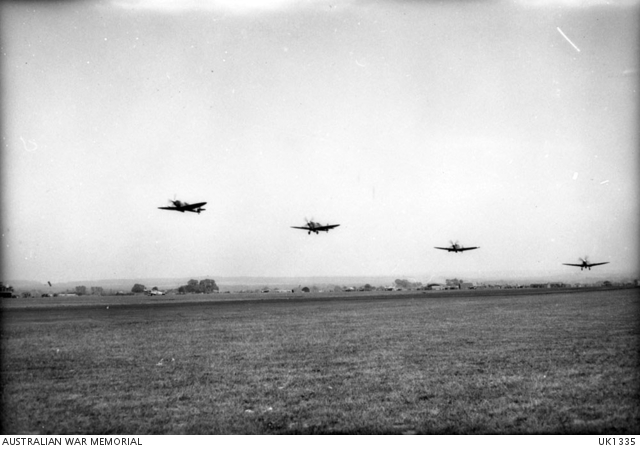 453 SQUADRON RAAF OF THE SECOND TACTICAL AIR FORCE, BASED AT RAF STATION FORD, TAKE OFF ON AN OPERATIONAL SORTIE OVER ENEMY TERRITORY. “The first step in the training of all aircrew is the Initial Training School. Here they are given a basic theoretical training and finally categorised as suitable for pilot, navigator, air gunner etc. 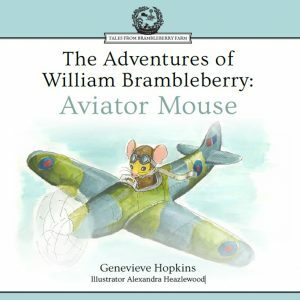 Those selected as pilots then proceed to an Elementary Training School where they are taught to fly an aircraft such as the “Moth” and where some idea of their ability as pilots is obtained. 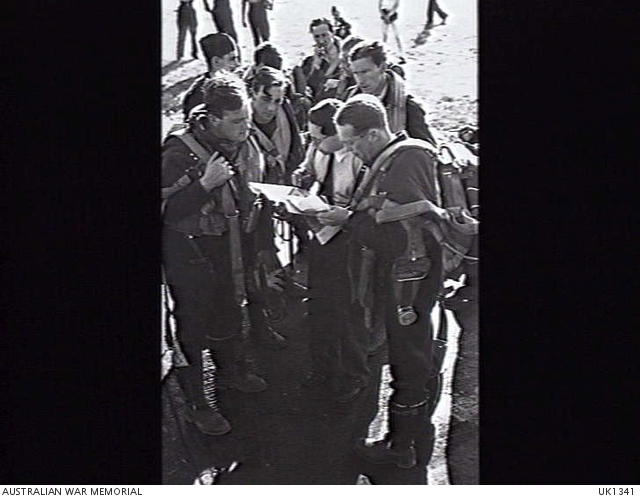 At the conclusion of this course those selected as Single Engine Fighter Pilots are transferred to a Service Flying Training School (SFTS) where they are given a course on single engined aircraft of the monoplane type such as the Wirraway or the Master whose performance and characteristics are approaching those of operational aircraft. This course is fairly extensive and includes such items as air gunnery and navigation. On arrival in the United Kingdom these pilots are given what amounts to a refresher course at an A.F.U where the same type of aircraft are flown as at an SFTS and finally to a Fighter Operational Training Unit where they are taught to fly the type of machine, e.g. Spitfire or Hurricanes, which they will actually be using operations. They are posted to squadrons as operational pilots. On arriving at their squadrons however they find that their training is by no means complete from the squadron point of view and that a quite extensive training programme still lies ahead of them. Besides an intensification of their ground training dealing with such matters as aircraft recognition, anti-aircraft defences etc., matters which fall into the province of the Intelligence Officer, considerable flying training is still necessary. 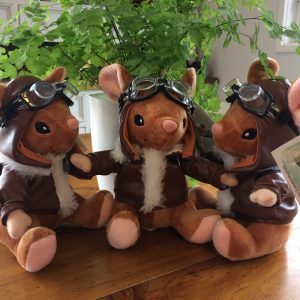 At this stage, although the pilot has now quite a respectable total of flying hours in his log book comparatively few of them are in the operational aircraft he will now be flying. Further experience on this aircraft is consequently needed. 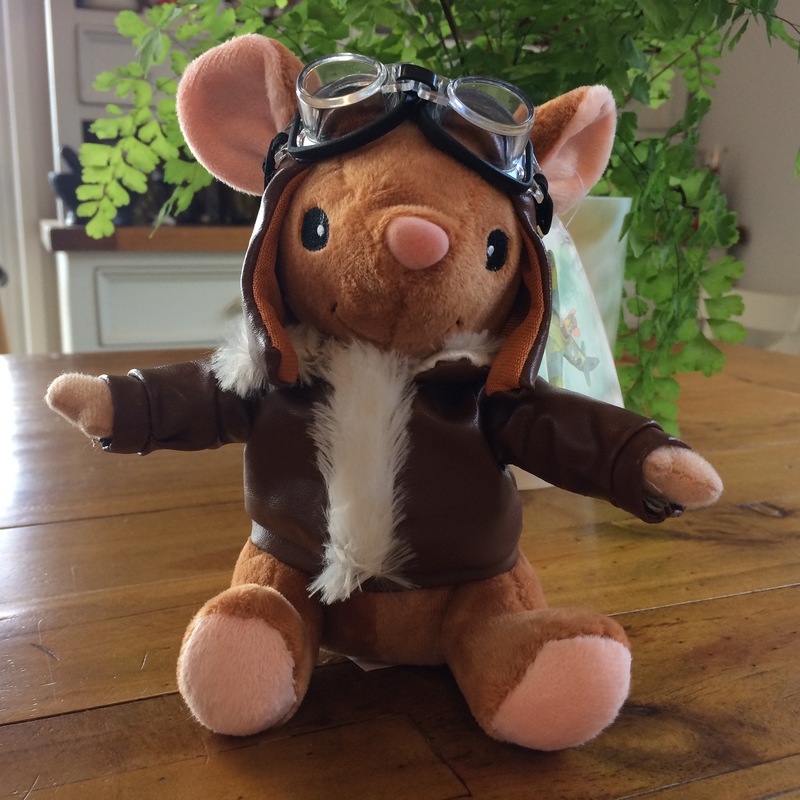 In addition, since team work is an extremely important factor in air combat he must be fitted into the squadron’s combat structure and must learn to operate as part of a unit and not entirely as an individual. To obtain these results a considerable amount of flying is necessary. He must fly both by himself and in squadron formations of all kinds from the pair which forms the basic combat unit to the full squadron formation. Also since ground control is a major factor in fighter operations he must gain experience of its working before being allowed to take part in operations. 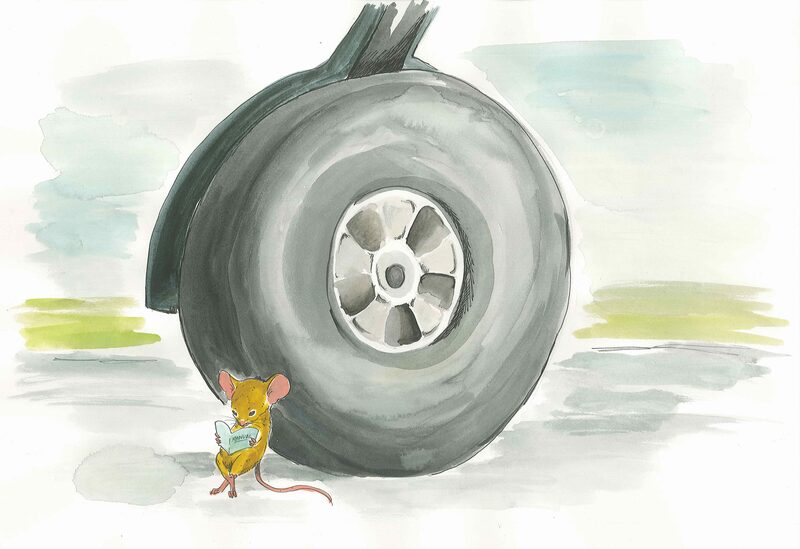 Illustration of William Brambleberry studying to be the best, most adventurous aviator mouse in all the world.